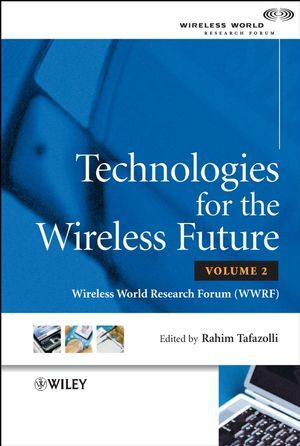 This fully updated second volume of the highly successful WWRF Book of Visions is a unique and timely book, presenting up-to-the-minute ideas and trends in mobile communications. This is a comprehensive single point of reference, focusing on the specifications and requirements of 4G and identifying potential business models, the research areas and required spectrum and enabling technologies. Comprising material from White Papers edited within the working expert groups as well as those from the Vision Committee of WWRF, a top-down approach has been adopted starting from perceived users requirements and their expectations in the Future Wireless World. Professor Rahim Tafazolli is Head of the Mobile Communications Research Group at the Centre for Communication Systems Research, University of Surrey, UK. His research activities are on optimization techniques for mobile multimedia networks, mainly on advance Resource management, Mobility management and Media Access Control. He has published more than 300 research papers in refereed journals, international conferences and as invited speaker, and has more than 15 patents in the field of mobile communications. He is the founder and past Chairman of International Conference on “3G Mobile Technologies”. He is also member of IEE Committee on the UK Regulations on “Information Technology & Telecommunications”, a member of the WWRF Vision Committee, and past Chairman of “New Technologies” group of Wireless World Research Forum (WWRF), and academic co-ordinator of the UK Mobile VCE (Virtual Centre of Excellence). 1. Introduction Edited by Mikko Uusitalo (Nokia). 1.1 Goals and Objectives – Shaping the Global Wireless Future. 1.3 The International Context and B3G/4G Activities. 2. Vision and Requirements of the Wireless World Edited by Mikko Uusitalo (Nokia). 2.1 What we are Observing Today in 2005. 2.2 What is on the Way for 2010? 3. User Requirements and Expectations Edited by Angela Sasse (University College London, UK). 3.2 The Role of Scenarios in The Development of Future Wireless Technologies and Services. 3.3 Advanced User Interfaces for Future Mobile Devices. 4. Service Infrastructures Edited by Stefan Arbanowski (Fraunhofer FOKUS, Germany) and Wolfgang Kellerer (DoCoMo Euro-Labs, Germany). 4.2 Requirements for Future Service Platform Architectures. 4.3 Generic Service Elements and Enabling Technologies. 5. Security and Trust Edited by Mario Hoffmann (Fraunhofer SIT), Christos Xenakis, Stauraleni Kontopoulou (University of Athens), Markus Eisenhauer (Fraunhofer FIT), Seppo Heikkinen (Elisa R&D), Antonio Pescape (University of Naples) and Hu Wang (Huawei). 5.2 Trust Management in Ubiquitous Computing. 6. New Air-interface Technologies and Deployment Concepts Edited by David Falconer (Carleton University), Angeliki Alexiou (Lucent Technologies), Stefan Kaiser (DoCoMo Euro-Labs), Martin Haardt (Ilmenau University of Technology) and Tommi Jäamsä (Elektrobit Testing Ltd). 6.3 Smart Antennas, MIMO Systems and Related Technologies. 6.4 Duplexing, Resource Allocation and Inter-cell Coordination. 6.5 Multidimensional Radio Channel Measurement and Modeling. 7. Short-range Wireless Communications Edited by Gerhard Fettweis (Vodafone Chair, TU Dresden), Ernesto Zimmermann (Vodafone Chair, TU Dresden), Ben Allen (King’s College London), Dominic C. O’Brien (University of Oxford) and Pierre Chevillat (IBM Research GmbH, Zurich Research Laboratory). 7.2 MIMO–OFDM in the TDD Mode. 7.3 Ultra-wideband: Technology and Future Perspectives. 8. Reconfigurability Edited by Panagiotis Demestichas (University of Piraeus), George Dimitrakopoulos (University of Piraeus), Klaus M¨oßner (CCSR, University of Surrey), Terence Dodgson (Samsung Electronics) and Didier Bourse (Motorola Labs). 8.2 Application Scenarios for Reconfigurability. 8.3 Element Management, Flexible Air Interfaces and SDR. 8.4 Network Architecture and Support Services. 8.5 Cognitive Radio, Spectrum and Radio Resource Management. 9. Self-organization in Communication Networks Edited by Amardeo Sarma (NEC), Christian Bettstetter (DoCoMo) and Sudhir Dixit (Nokia). 9.2 Self-organization in Today’s Internet. 9.3 Self-organization in Ad Hoc and Sensor Networks. 9.4 Self-organization in Network Management. 9.5 Graph-theoretical Aspects of Self-organization. 9.6 Potential and Limitations of Self-organization.